Carlos Betancourt, The Pelican Passage. Photo Marilyn Loddi. 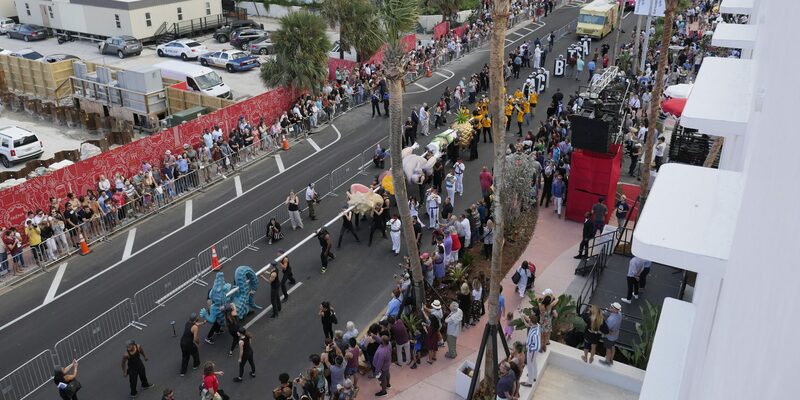 Building upon parades, carnivals, and other public ceremonials from across the Americas and the Caribbean, Tide by Side inaugurated the Faena District Miami Beach with new commissions and American premieres of works by an international cast of artists and performers. 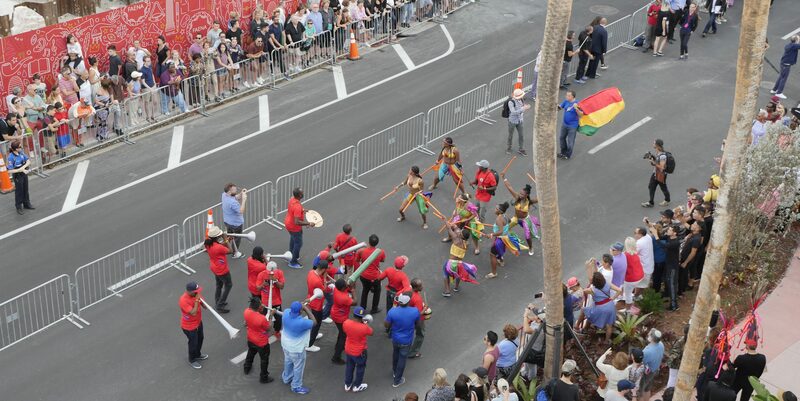 The outcome of a two-year collaboration on an unprecedented district- and city-wide scale, with more than 30 South Florida cultural institutions and hundreds of participants, Tide by Side took the form of a processional performance that provided a framework for a collective celebration of, and reflection on community and creation. Drawn together by a mutual interest in the politics and aesthetics of parades, my co-directors Gia Wolff and Arto Lindsay and myself devised an evolutive dispositive for the performance throughout the West side of the District, between Indian Creek Drive and Collins Avenue. 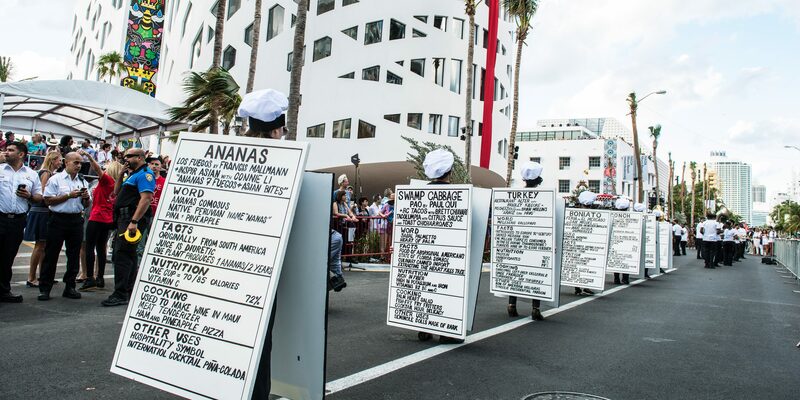 Revolving around the iconic new OMA/Rem Koolhaas/Shohei Shigematsu buildings, in and out, on and off and around the Faena Forum, Faena Bazaar and Faena Park, we sought to instill a double processional motion within and without the artists’ works, among performers and audience members alike, as in a carousel. 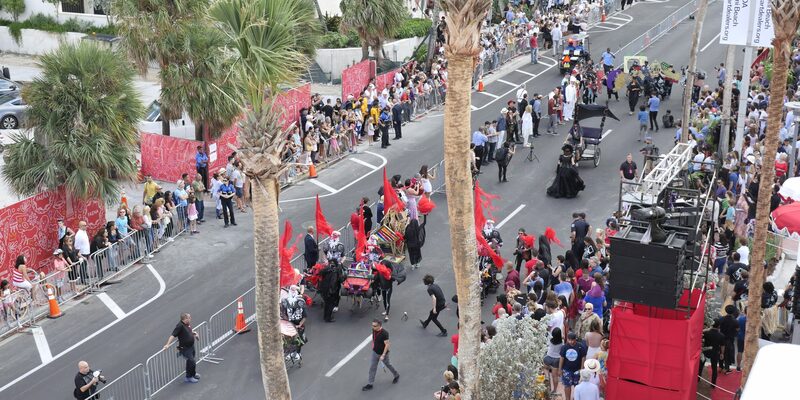 Distributed throughout the four blocks of the district, Wolff’s intervention consisted in inserting a set of elements in the raw aesthetics of roadwork equipment that doubled up as risers and bleachers for audience seating, thus setting navigational challenges on the parade route. 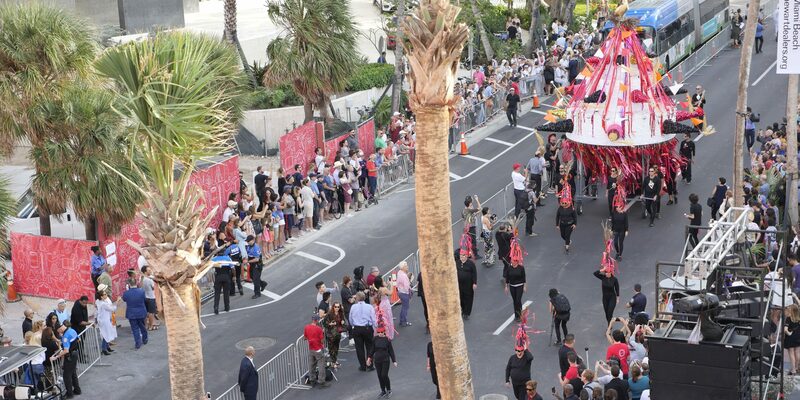 Far from being restricted to the road, the processional stage, so to speak, was composed in equal part of the large sidewalks designed by Raymond Jungles and of two of the three lanes of Collins Avenue, Miami’s major northbound artery. 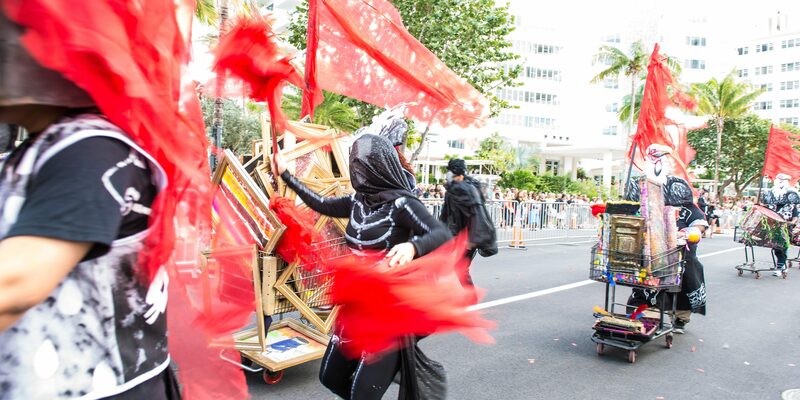 The spatial maneuver forced an otherwise linear flow to contort and invited rotating segments of the public, otherwise primarily watching from the sidewalks to occupy space that was now part of the route and to experience the parade from within, in closer interaction with the performers. 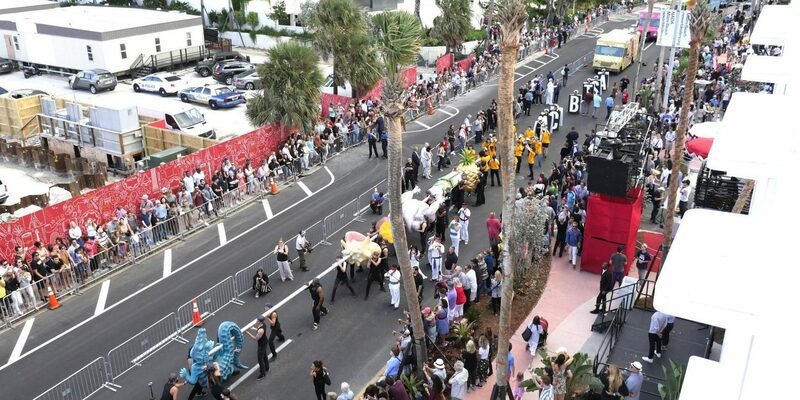 In reminding us of the reality principle of traffic of which Collins Avenue was purposefully, if only partially cleared to hold the parade, Wolff’s prompted us to reflect upon the mutual accommodations necessary for the enjoyment, albeit temporary, of the integrated artistic and civic proposition that is Tide by Side. In like fashion, Lindsay’s soundscape, created with musician Melvin Gibbs and sound artist Stefan Brunner introduced dissonances to the expected sonic accompaniment of a parade by way of digitally enhanced riffs on live renditions of old and new tunes in collaboration with the Tide by Side artists and composers. Musicians and interprets—ranging from conch-shell players led by father and daughter Alfredo and Yuridia Martinez of Ameyal Mexican Cultural Organization, the Rara Lakay rah-rah band under the direction of Benjamin Martineau, the 305 Street Band marching band directed by Michael Randle and a pots-and-pans ensemble led by Matthew Evan Taylor among other musical outfits—came together with and within Lindsay’s soundscape to create a meta-melody quite literally unheard of. 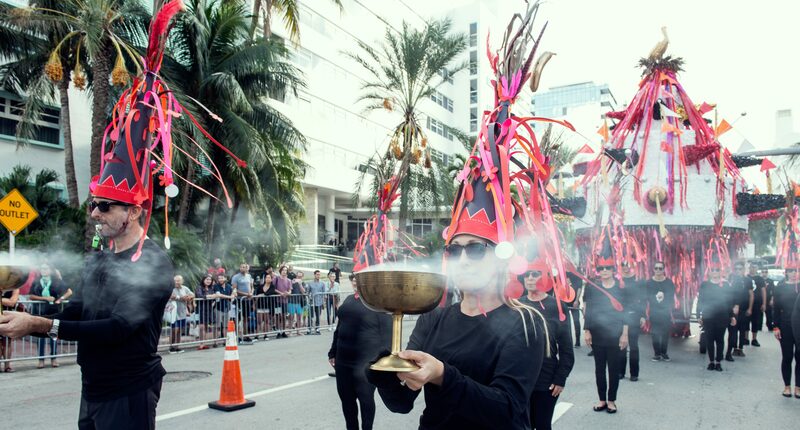 Setting off the festivities were Los Carpinteros, who presented their first rendition of Conga Irreversible in the United States, a Cuban conga performed in reverse that upended expectations associated with the dance and musical traditions of the genre. Reinterpreted through a musical arrangement by musician and composer and Harvard Jazz Band Director Yosvany Terry, choreography by Isaias Ramírez of Compaña Folklórica Ban-Rarra assisted by Yaselis Sánchez Correa, and costume design by Abraham García of Havana’s Tropicana nightclub fame, the backward motion of this retro-conga, first presented during La Bienal de La Habana in 2012, seemed a timely metaphor for the movement of the Caribbean country—and some would say, of this country as well. 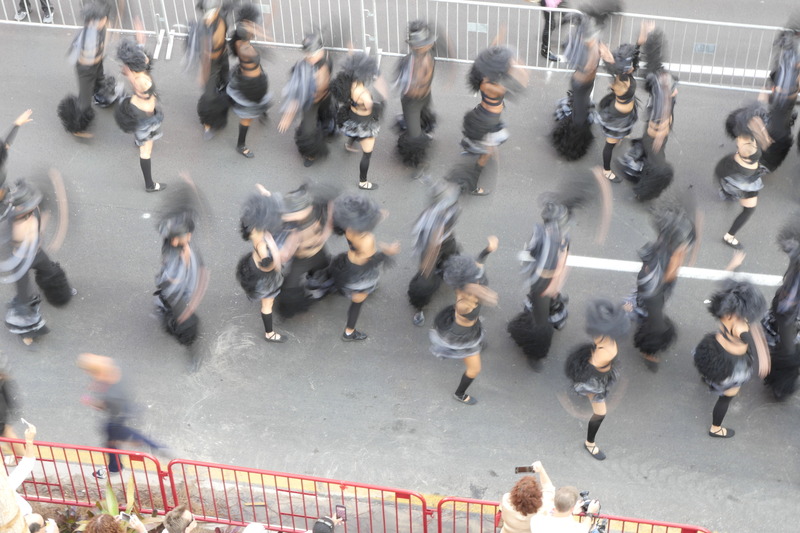 Displaced to Miami Beach and expanded upon with a cast in part made up from the original Cuban dancers and performers and in part drawn from Miami’s Cuban-American performing arts community, the retro-conga highlighted the workings of cultural translation in relationship to political change, a year after the reopening of the diplomatic relations between Cuba and the United States. It acquired yet a more poignant meaning as it took to the streets two days after the ultimate demise of El Comandante. a gesture toward the power of inclusion and the pleasures of belonging through common action—in this case, veneration and devotion. 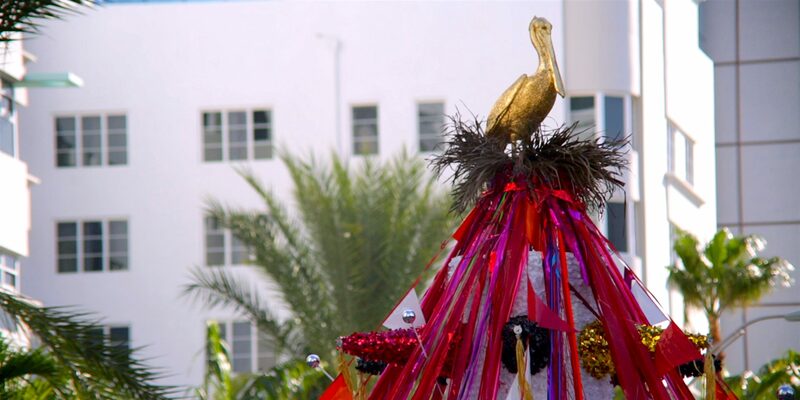 More powerfully yet, as a mythical figure associated with the spirit world, the tutelary pelican conferred a spiritual resonance to the life cycle initiated with the opening of the new cultural institution. 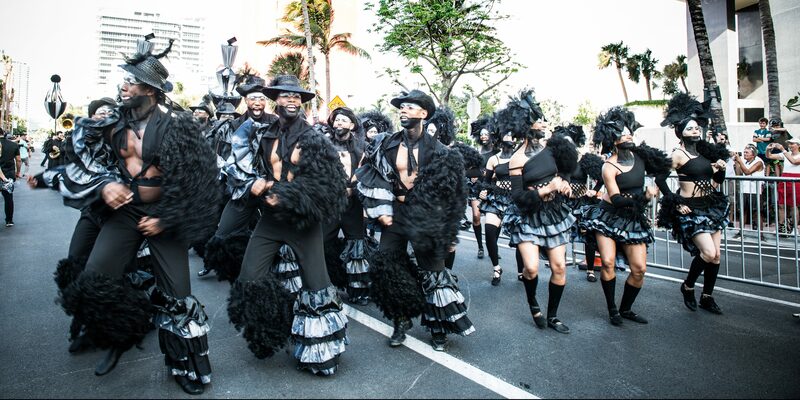 Under the artistic direction of Celeste Fraser Delgado and Damián Rojo, in collaboration with musical director Brian Potts, Carnival Arts’s Siren Song was a tongue-in-cheek take on the meaning of luxury. The piece’s general narrative was imagined by youths and students from diverse backgrounds led by Fraser Delgado through the rhythmic patterns and visual aesthetics of Kongo, Yoruba, Ibo and African diasporic cultural traditions. 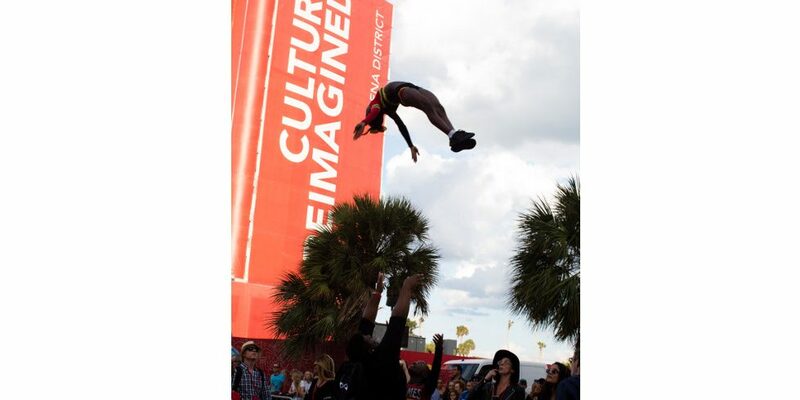 It was subsequently developed during workshops held with Miami Bridge Homestead, PACE Center for Girls, Thomas Jefferson Middle School and Barry University throughout 2015–2016 and led by a wide array of leading art practitioners from Miami’s extensive cultural communities. Dancers and choreographers included Marisol Blanco and Yanui of Tradisyon Lakou Lakay; singers, Kaïsa and Ketli; and musicians, Arelan Torres and Ton Ton among others. 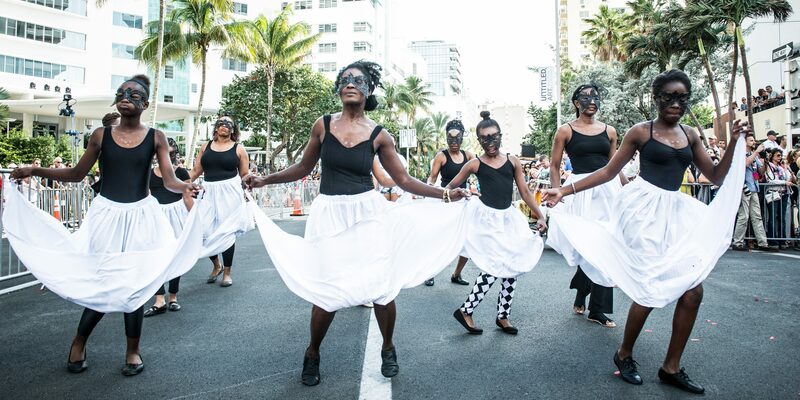 Ultimately, the three-section work—a small processional of its own—transformed the Haitian folk character La Sirène into a contemporary figure imbued with self-affirming powers exemplary of multicultural formations thrust into the maelstrom of societal change. Slithering through the narrow interstices in between the larger groups, Ernesto Neto presented a new version of Jibóia, the open-form, multi-performer, snake-like wearable net that is as much a warning of the perils of climate change as it is a homage to the potency of conscious action in countering its effects. Jibóia, appeared in flashes, streaming sideways through the main processional flow at various intervals, like the very flashes of consciousness that seize ever greater segments of society over this issue. 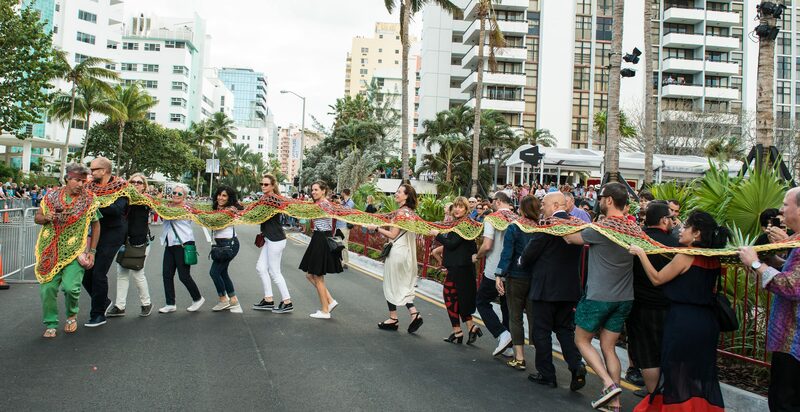 First performed during the Global Climate March in Vienna in 2015, Jibóia was introduced in Miami courtesy of Thyssen-Bornemisza Art Contemporary (TBA21). largest iteration, in the United States, of her ongoing performative pedagogical platform, The School of Narrative Dance, a multidisciplinary nomadic school that strives to harness the emancipatory power of communal creative processes. 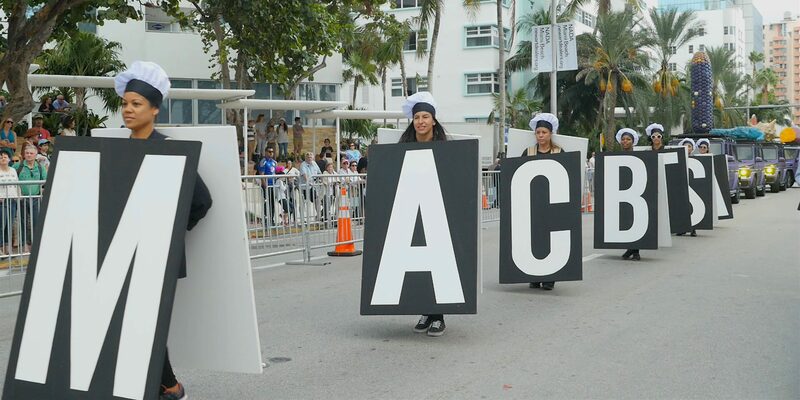 Theatrically staged throughout the upper and lower levels of the architectural icons along Collins Avenue, and set into motion by the Miami’s myriad artistic communities and social organizations headed by dancer and choreographer Jojo Vela, the Miami Beach School of Narrative Dance featured cultural formations fostered by the new art district. 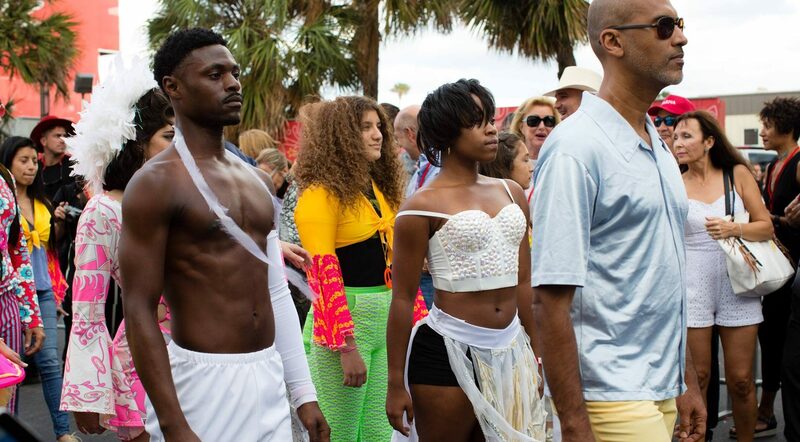 In choosing to come from the opposite direction, against the northbound tide, The School of Narrative Dance Miami Beach highlighted the perils of its position, showing that another, ultimately more reflexive and mayhap more ethically challenging place exists and is worth striving for. 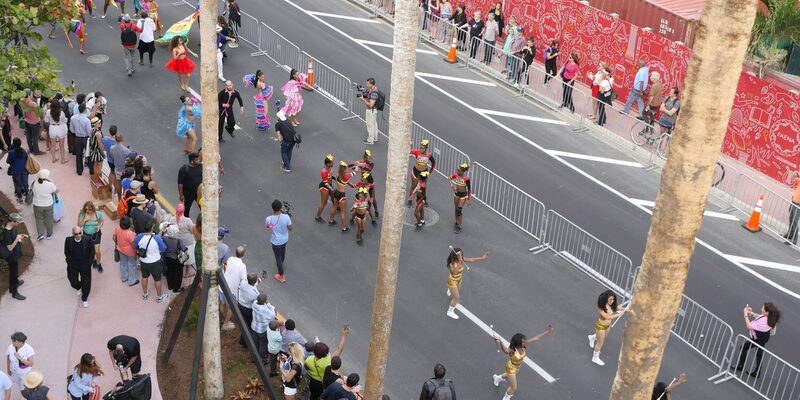 In so doing, Senatore reminded us that parades, like the march of history, want to go forward, yet often don’t. 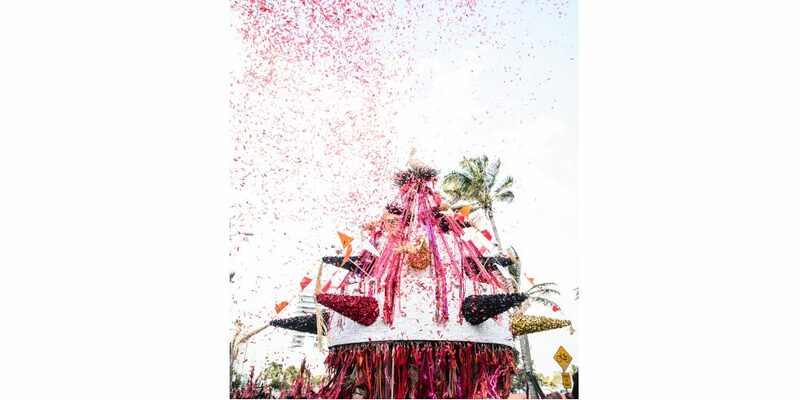 Tide by Side culminated in a mobile feast of commanding proportions that put both cultural tastes and culinary traditions into historical perspective. 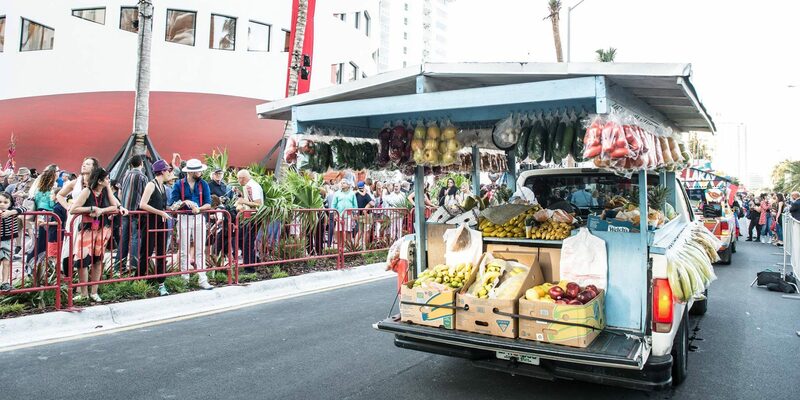 A vehicular processional, The Last Ingredients by Miralda was was primarily comprised of food trucks, luncheras and ambulantes, the mobile kitchens and restaurants commonly spotted in Miami. 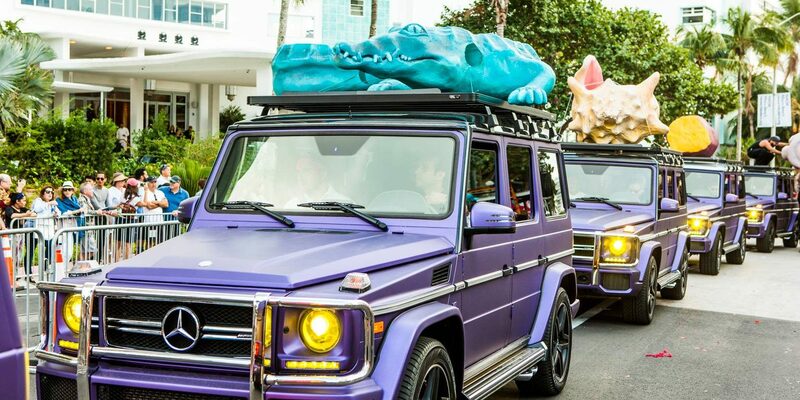 It also featured uncommon carriages like…a limousine-drawn barbecue for an alligator. 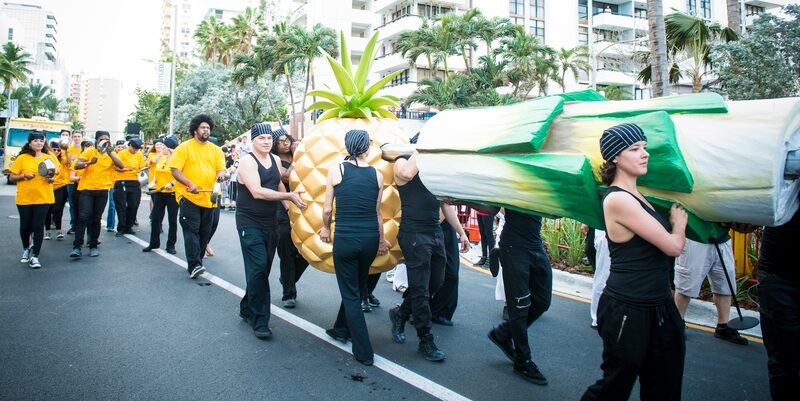 The processional’s centerpiece however, were seven of South Florida’s historic staples—palm cabbage, maize (corn), ananas (pineapple), boniato (sweet potato), alligator, turkey and conch—the likenesses of which were represented in a monumental multi-part sculptural formation carried by an ensemble of performers. The actual ingredients were reimagined into experimental menus composed by teams of renown Miami restaurant and hotel chefs such as Jeff McInnis and Janine Booth of the Sarsaparilla Club, Bradley Kilgore of Alter—as well as the Faena Hotel’s very own Francis Mallmann of Los Fuegos and Paul Qui of Pao—and food truck chefs Alfred Montero of Mr. Good Stuff, Brett Chiavari of BC Monster, Connie Lee of Inspir Asian, and many others. 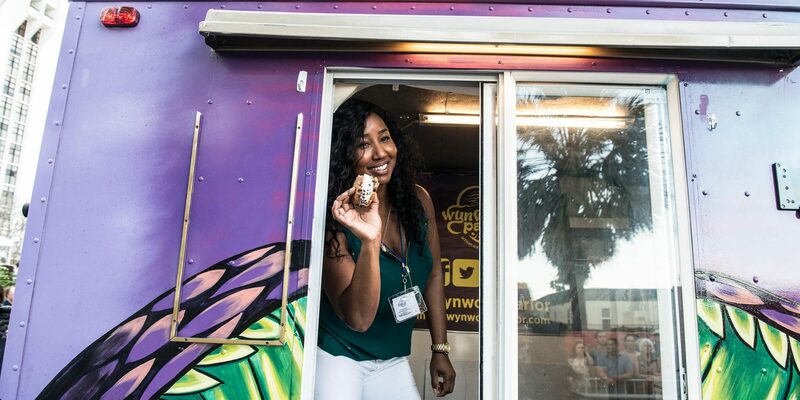 As global haute cuisine integrated native ingredients and mixed with fusion street food thanks to the baroque culinary imaginary of Miralda, The Last Ingredients provided a taste of the utopian, Miamian dream of a melting pot. 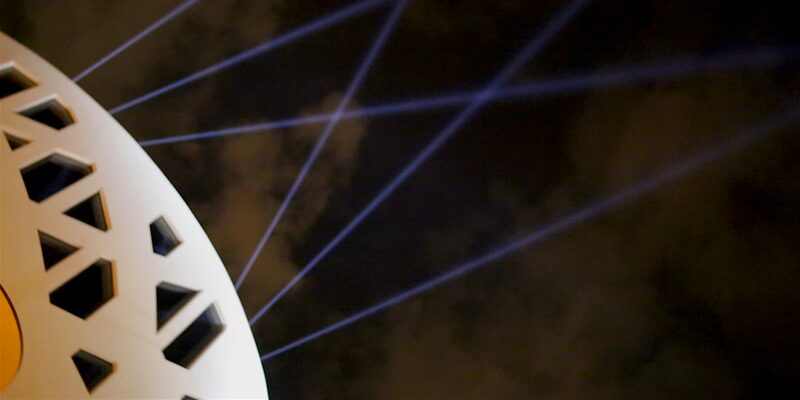 With nightfall rose a new dawn as Horizon, a canopy of light of Wolff’s design, stitched the District back together again by uniting all its buildings on either side of Collins Avenue through a net of light rays that took on the blue tint of the maritime haze. 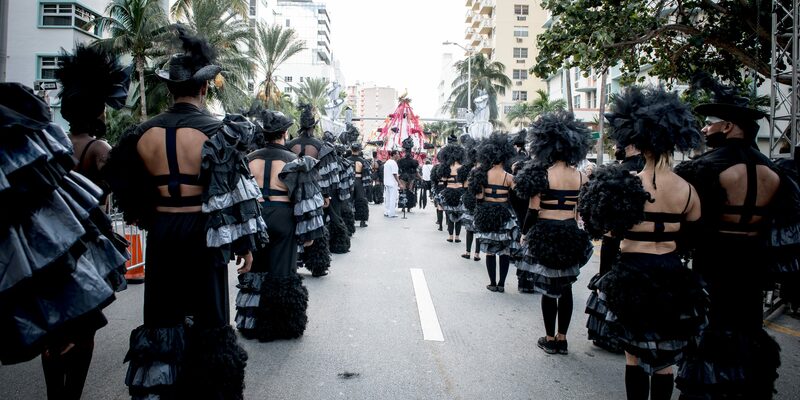 Engaging with the poetics of urban space and the experience of everyday city life along Miami Beach’s most vital artery, Tide by Side updated the tradition of the processional performance as an artistic practice and form of public address with mass appeal for the 21st century. 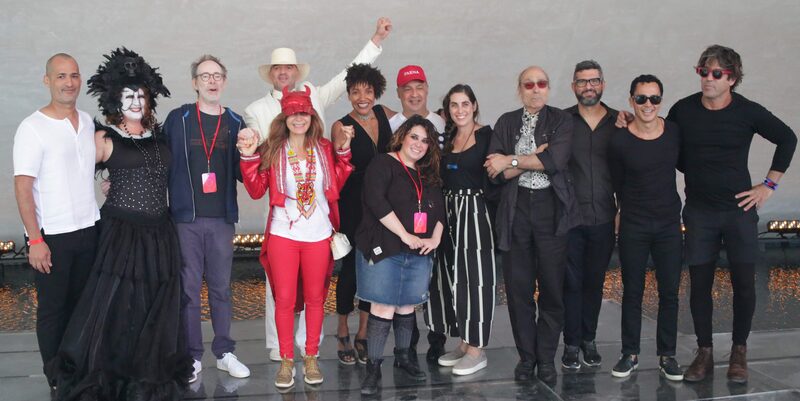 It not only celebrated the opening of Miami’s newest cultural district with people, food, and music; it also pondered the importance of cultural communities amidst new urban developments and tested the conditions for the formation of new constituencies, tide after tide, side by side. 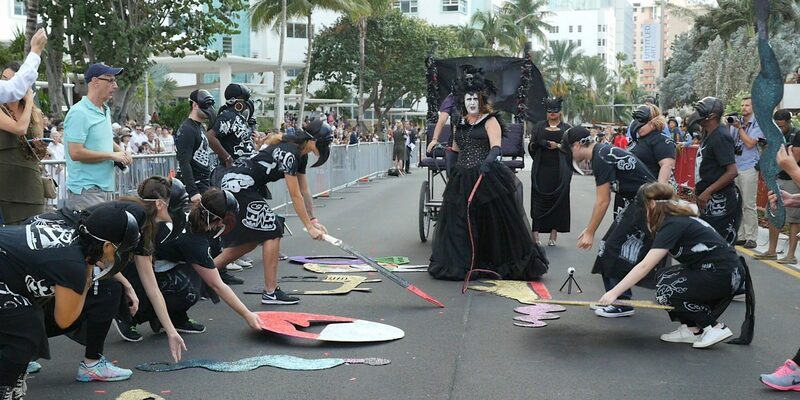 …a typically nontraditional event this week, a “processional” called “Tide by Side” that was conceived by the performance art specialist Claire Tancons.